Although there is some debate over which organism is most responsible for removing the waste products of fish from water in nature, there is little question that plants can and do use many of these wastes from the water in which they grow. Many aquaria thrive and have almost no nitrate in the water when fish loads are kept low and aquatic plants are actively growing. All actively growing plants will remove some quantity of fish waste from the water. Unfortunately, not all aquaria can be densely planted with aquatic plants, either because the husbandry of the plants is difficult or because the fish are incompatible with plants. In some specialized aquaria the situation is made worse by such things as low pH that can slow or stop nitrifying bacteria. Recently, efforts have been made in aquaculture to use the water from fish farming to feed hydroponic crops in a process often called aquaponics. There has been a great deal of success growing leafy greens, herbs, and other terrestrial plants hydroponically in the water used for growing farmed fish, usually tilapia ( Oreochromis sp.). This type of system removes a great deal of nitrate from the water and allows the systems to be recirculated many more times than had previously been possible. To put this into perspective though, it is important to realize that farmed tilapia are raised at densities equivalent to two 30cm oscars in a 40L aquarium! Obviously, we neither want to nor should treat most of our fish the same way farmed food fish are, but as with many industrial processes, there is often a way to scale things down for use in the home. 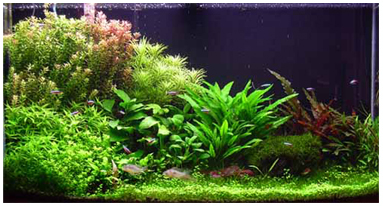 Plant filters can be an effective way to provide some or all of the filtration to almost any aquarium. There are several limiting factors in homes that need to be taken into account when designing plant filters for the home. First among these is light. Most people have their aquaria away from the sunny south window simply to avoid an excess of unattractive algae. Unfortunately, this means that that the majority of fast growing food crops will not be happy when grown hydroponically on the top of your fish tank. In fact, many plant filters have been designed that use supplementary light in the form of fluorescent lighting to encourage the plants to photosynthesize and thus remove more nutrients from the water. The use of artificial lighting can provide other benefits as well. A reverse daylight schedule can be used for the plant filter so that any oxygen provided by the plants is available to the fish when they need it most, at night when any aquatic plants in the tank will be consuming oxygen. Another limiting factor is nutrients. In typical hydroponic food culture there are enough dissolved salts in the water to bring the conductivity to 2 to 3 mS/cm. This is several orders of magnitude higher than the ideal for most fish. Hydroponic solutions are also created by carefully mixing inorganic salts at specified ratios thus creating a balanced solution for the plants. Many fish simply will not tolerate these chemicals. This means once again that high-energy food crops are out of the question for most (if not all) ornamental aquaria. In getting around the limitations imposed on us, there are several options available. The first is to provide supplemental nutrients. This approach is commonly taken in commercial ventures but since this is an article about optimizing conditions for the fish, I will not encourage it. What I will encourage is the use of low energy terrestrial plants to strip the water of excess nutrients. Although almost any plant can be grown hydroponically, in the interest of convenience, I prefer to use plants and systems that can be used over the long term with a minimum of maintenance. I prefer tropical plants that spend most of the year actively growing and tend to adapt well to the temperature of tropical aquaria. Further, the ability to survive in relatively low light with low but constant levels of nutrients is a must. The plants must have roots that will spread and cover a substantial area and they must thrive in wet environments. In the rainforest, I have observed several types of epiphytes and semi-epiphytes growing in the tree canopy and up the trunks of trees. The plants that really struck me as being ideal plant filters were the various types of philodendron which grow from the forest floor and will wrap epiphytic roots around the trunks of trees as they make their way up the tree toward the light. Watching the water run down the trunk of the trees (they don't call it the rain forest for nothing!) I could see that the fine roots attached to the trunk were ideally positioned to intercept any dissolved nutrients on their way to the ground. Naturally, most of my plant filters since then have included some type of philodendron. I have also had very good luck with Chinese evergreens and in one case Phalenopsis orchids. When extremely messy fish are involved such as large cichlids, I have used faster growing lettuce at the inlet to the filter followed by the slower growing plants closer to the outlet. In order to easily remove organic compounds from the water, plants make use of several methods including ion exchange, usually with symbiotic bacteria (including our friends the nitrifying bacteria) and often fungi which colonize the root system and break down complex molecules into more easily assimilated forms. For this reason, plant filters remove the highest percentage of nutrients from the passing water when slow rates of flow are used. Higher rates of flow will mean that the plants will allow more nutrients to get passed them. Slowing down the flow may be as simple as encouraging the plant to build a mass of roots which effectively allows water to pass quickly around the mass while the center of the root mass has the required slow flow. Water that flows through the roots of the plants should be rich in oxygen in order to discourage root rot. There are several methods of hydroponic and non-hydroponic culture that can be effective for plant filters. The simplest is probably a Perlite bed fed by drip irrigation. A container (usually less than 30cm deep) has a drain placed on the bottom where it can drip back to the tank or sump. The drain is fitted with a screen to prevent Perlite from flowing back to the aquarium. Plants are fed by slowly dripping water through the Perlite bed. The flow rate should be low enough that the Perlite bed does not become saturated. Since drip emitters can often clog when organic material passes through them, I usually use a canister filter to pre-filter larger particles from the water. The plants in this system will be drawing all of their nutrients from the water so it is sometimes necessary to supplement with trace elements for the benefit of the plants. These plant filters can be located quite far from the tank although they do need to be higher than the water that they are draining to in order to avoid flooding. They also need occasionally to have the drip rate adjusted or the drip hose cleaned. Peat or coir (coconut husk) can be used instead of Perlite but the drip rate needs to be really slow and the tannins will turn the water brown. When using plants which root along the stem such as philodendrons, the plant itself can be grown in a pot of standard potting mix while the stem roots are encouraged to grow into the water. It is best to place the roots in the outflow from a power filter or in the flow from an air stone to discourage root rot. 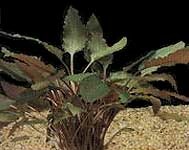 The biggest advantage to this is that the plant is not forced to gain all of its nutrients from the water and the potting mix can be fertilized with trace elements that might not be desirable in the aquarium. This also has an attractive "plant next to the aquarium" look to it that many people enjoy. The fish seem to like the hiding places provided by the plant roots as well. Plant filters can be an inexpensive and low-tech supplement to (or replacement for) an existing filter. The plants are usually easier to care for than aquatic plants and in cases where the use of aquatic plants is impossible, they are much better than no plants at all. They are not a substitute for good aquarium maintenance but they can go a very long way toward providing a better aquatic environment for your fish. Other aquarium clubs and non-profit organizations can use this, or other articles, in their own journals or web sites, provided that credit is given to the author, the Calgary Aquarium Society, and The Calquarium. In the case of a reprint in a hardcopy publication, two copies of the published work are sent to the Calgary Aquarium Society at its mailing address. And in the case of a reprint in an Internet publication, a link back to the original article site must be provided in a prominent location.